Portable Air Conditioners – Incredibly versatile, our range of portable air conditioning units can be utilised in different combinations to cool a huge variety of sites. Ranging from small units for individual offices to 20kW units for server rooms, data centres and so much more. Fans – Ranging from large underground tunnel extraction systems to small personal office fans and large slow moving air movers, we have a comprehensive and versatile range of fans to suit all applications. Packaged Units – Ranging from 18kW to 113kW, our packaged air conditioning units are placed outside the cooling or heating area with the conditioned air being ducted into the space via a specifically tailored air distribution method. Chillers – Ranging from 60kW to 750kW in both standard and low temp, our large range of fluid chillers are used in manufacturing, hospitals, construction sites, event sites, building maintenance shutdowns and a host of other cooling applications. Evaporative Coolers – Used mostly in dryer, inland environments, evaporative cooling is an effective and relatively inexpensive method of cooling for applications such as factories, warehouses and some events and offices. 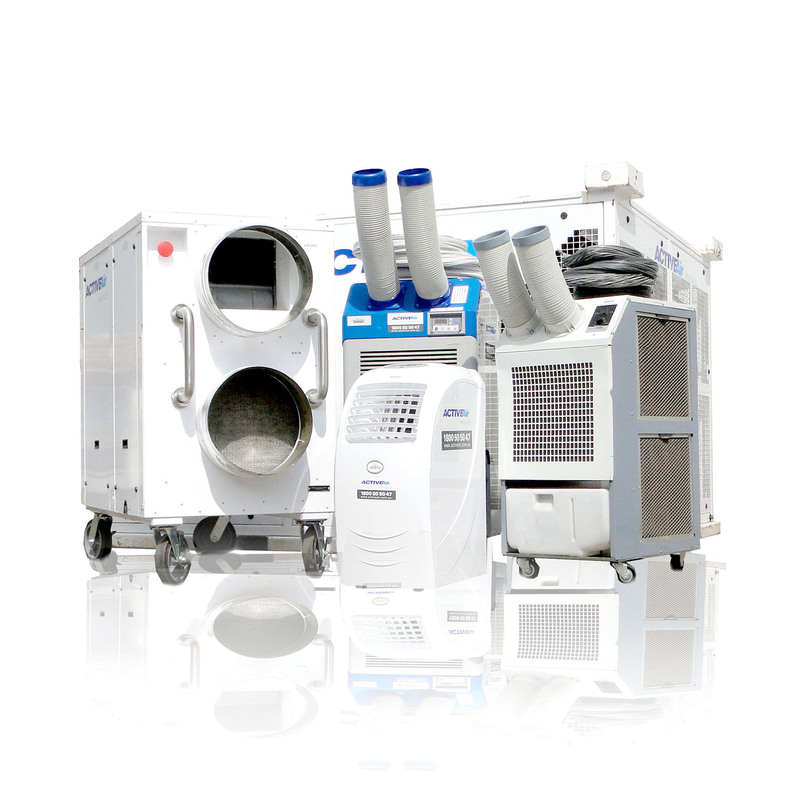 Air Handlers – Used in combination with our fluid chillers, air handlers are an effective and efficient method to deliver cool air to the desired application. We provide custom builds and 110kW as standard. Ventilation – Whether it be providing ventilation to car park during constructions, railway tunnels, or removing diesel fumes during underground excavation, we have the right equipment and knowhow to provide you with an reliable and functional solution. Electric Heating – We carry a specific and versatile range of electric heaters, together with an excellent range of reverse cycle air conditioners. WIth both ranges available in both single phase and three phase power. Regardless if the applications, we’ll be able to provide a solution. Gas Heating – Ranging from spotless patio heaters for your prestigious event to 80kW gas fired HVAC units to heat your exhibition hall. We have a reliable and versatile range of gas heaters available to meet your needs. Boilers – Typically used in multi story office and apartment buildings, our boilers have provided comfort heating to thousands. Also used in conjunction with a chiller water solution to provide year round climate control. Generator Hire – From 15 – 500kVA generators we have them all and for every kind of temporary power requirement. Distribution Boards – Power. We have lots of it. 15 – 400 amp distribution power boards. All well maintained, weather proof, easy to move and durable. Mobile Cool Rooms – These are most often used in large environments alongside manufacturing machinery and process lines offering relief to workers. Active Air was founded in 1972. We have consistently grown and evolved both in size and service offerings on the back of an obsession to provide outstanding service and maintain excellent relationships with our clients. We're proud sponsors again this year for the @KareelaGolfClub annual charity golf day raising funds for the Bates Drive School.